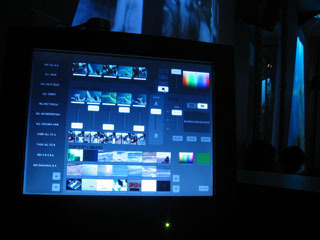 A touch screen interface integrated into the DJ booth enables full control over all projections. Even though the system allows detailed adjustment of all the parameters for each channel the learning effort is kept to a minimumthe by using simple and intuitive press and drag behaviours. All settings including loaded clips, playback speeds, mixing constellations, colours and distortions of projections can be saved into presets. A preset can then be recalled with a single button press.